I love to find a relaxing coffeehouse wherever I am in the world. And really, its not about the coffee – its about the atmophere of an oasis of recreation with delicious drinks, snacks, comfortable seats, wi-fi – simply a place to work, relax or meet friends. When you move to a new place, there are a few things you have to find: a supermarket, a reliable drugstore or doctor, schools, maybe a gym, good restaurants - and a coffeehouse. These are the things we need to re-create our lives and day-to-day routine in a new environment. Looking back, I wanted to believe my oasis could be Starbucks, simply because of its international concept. Of course this kind of coffeehouse is nothing like my hometown coffehouses. But in the time since it appeared on the Austrian market, I came to appreciate the soothing jazz, the interior, the drinks. When I started travelling more and more, it was a familiar point anywhere in the world. A sort of living room or home base, or an “international embassy” of coffee lovers. When I first visited Moscow, as a very naïve tourist who never really thought that a few years later this would become kind of my hometown, there was no Starbucks. When I came back in 2008 to work as an intern, Starbucks had arrived. But after a few visits, I was slightly dissapointed. The service wasn’t quite what I was used to from other countries and ordering a coffee-caramel-frappucino ended in my receiving two separate drinks. Even though Starbucks has since improved dramatically in my eyes, (and now the coffee-caramel-frappucinos are not a problem at all any more) I was motivated to find alternatives. Maybe I wouldn’t need my international retreat at all! I wanted to find a perfect local alternative. Equipped with notebook and reading material, I started my search. I began on the "mile-of-cafes" on Maroseyka Street, near metro station Kitai-Gorod. Left and right coffeehouses line up, giving me every choice possible. European-style cafes that remind me of cafes in Vienna are next to Russian cafe-chains, Kofe haus and Shokoladnica. Starbucks is a little further down the street and a place called Coffee Bean. I feel a special flair around this area. It has something creative, little boutiques, smaller, even colorful houses, many foreign people and a lot of restaurants with exotic cuisine. Eric Kayser, the European-style café, looks just a little too fancy to be comfortable. Starbucks I already know, also they do not provide free wi-fi and most of the time they are out of the prepaid cards you need to use if you want to pay for their wifi. The only thing worth a special mention is the nice upper-level lounge in the one near Kitai-Gorod which is exceptionally comfortable and nice to sitin . Recently Starbuck opened an outlet in Respublica at metro station Serpukhovksaya, an interesting and modern bookshop that not only sells books, but cd’s, cult-toys, t-shirts and bags. The built-in Starbucks corner reminds me of bookstores like Barnes and Noble in the U.S.
Coffee Bean is a nice spacious café, with great breakfast, snacks, bagels, cupcakes with a slightly “green” or “alternative” touch with self service. Kofe Haus positively surprised me by being open 24 hours and having free wi-fi, very nice service, great business lunch with soup, salad, pie and drink for 300 rubles and great cakes for around 200 rubles. Here I feel that I have found the optimal work environment. Counters that face the windows are equipped with electrical outlets, free wi-fi and very subtle service that respects your privacy and doesn’t make you feel awkward about spending an entire afternoon with them even without ordering non-stop. Shokoladnitsa, in my opinion, has just simply the best atmosphere, salads and blinis. A personal favorite are the blini julien-style, and the Rimska okhota (Roman hunt) salad with veal, cranberry sauce, croutons, mushrooms and pistachio dressing. Their cakes are slightly less expensive, but also slightly smaller, than in Kofe Haus. And some of their coffee drinks can be really sweet. The only problems are the non-existant wi-fi and sometimes you have to wait too long for the check. Sometimes I get lucky, but experience has told me to be ready to wait up to 20 minutes to complete the process of paying your bill. Both, Kofe Haus and Shokoladnica are chains and simply everywhere in Moscow, so its very likely to find one of them anywhere you are. Also, they both offer breakfast and business lunches. And they have both orientated their menus towards Moscow’s taste for sushi, so next to cappuccino and cake you can order raw fish. 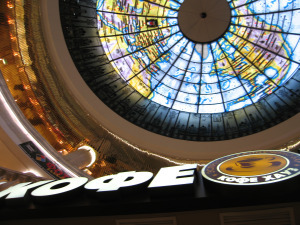 Kofe Haus: Shopping Center Okhotny Ryad, shopping center GUM (both near Red Square), train station Paveletsky. Shokoladnitsa: Metro station Oktyabrskaya, Metro station Baumanskaya, shopping center Evropeisky at Metro station Kievskaya. The search is not over yet. There are many other interesting cafes out there that I haven’t found yet. Time for another coffee safari! I’ll surely keep my eyes open.